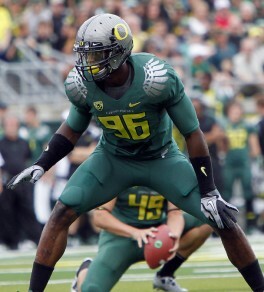 Where Does Oregon’s Projected 2013 Draft Class Rank Compare To Those Of The Past? When the NFL draft was instituted in 1936, the process was so primitive that it would be completely unrecognizable today. There were no scouts, no Internet, and no combine. Instead, executives simply selected players based on rumors, word of mouth, and newspapers clippings. In fact, the first draft in 1936 took place in a hotel room with the names of 90 players crudely scribbled on a blackboard. However, 1936 also saw the first Oregon football player drafted into the NFL when the Chicago Cardinals selected Ross Carter, a talented interior lineman, in the eighth round. The guard was six-foot-nothing, and weighed only 238 pounds at the time. 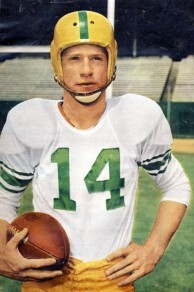 Carter marked the beginning of a long trend of Oregon football players turning pro through the NFL draft. Since 1936, nearly 175 Ducks have been drafted, and only twelve years have gone by in which the school failed to produce a single draftee. Oregon clearly has a rich, consistent history of putting talented players into the NFL. Nonetheless, some of the school’s draft classes have really stood out. The 1972 draft, for example, saw two Oregon players (Ahmad Rashad and Tom Drougas) taken in the first round, the only time this has happened in school history. That year, a total of five Ducks were drafted. In 2002, six Ducks were drafted, tied for the highest single-year total in Oregon’s history. This included Joey Harrington, who was taken third overall by the Detroit Lions, and Maurice Morris, who was taken in the second round by the Seattle Seahawks. 2009 also saw six Ducks enter the NLF through the draft, three of which were taken in the first two rounds (Patrick Chung, Jairus Byrd, and Max Unger). All three remain among the best at their respective positions. Finally, in 1955, All-American two-sport stud George Shaw was drafted first overall by the Baltimore Colts, the only Duck ever to be the first player taken off of the board. Come April, the 2013 draft class may become a new addition to this list. Dion Jordan, Kyle Long, Kiko Alonso, and Kenjon Barner are all but locks to be drafted in the first half of the draft. John Boyett, Michael Clay, and Jackson Rice also have the talent to play at the next level, and all three have a shot to be drafted in the latter rounds. This projected draft class has the potential to be elite for several reasons. In Oregon’s history, only twelve players have been drafted in the first round. Among those twelve, only four have gone in the top ten. This season, the Ducks have two potential first-round players in Dion Jordan and Kyle Long, who have both shot up draft boards with their athleticism and impressive workout results. Jordan, an outside linebacker/defensive end hybrid, has long been on the radar of NFL scouts. His long body and incredible speed are extremely attractive in a professional league with an increasing demand for faster, more versatile defenders. Long, the son of NFL Hall of Famer Howie Long, had an extremely strong 2012 campaign, and is flexible enough to play guard or tackle. Both had impressive combine workouts. Jordan ran a 4.6 40-yard dash, and Long clocked in an impressive 4.94 for a big lineman. These two players have had quite different experiences during their time in Eugene. Jordan has spent five years in the Oregon football program, entering as a tight end back in 2008. Long has spent only one year in the program, joining the Ducks as a junior college transfer before this past season. Both are extremely talented, athletic, and adaptable players that can help out any NFL team. Jordan’s combine workout all but solidified himself as a top ten (maybe even a top five) pick in the upcoming draft. Long is teetering on the edge between rounds one and two, but his ability to play multiple positions and impressive workout could make him a first round pick. Should these two players both go in the first round of the draft, it would be only the second time in school history that two players were drafted in the first round. Behind them, Alonso and Barner are also likely to be off of the board before the end of round four. Should this be the case, it would be only the second time in school history that four players have been drafted in the first four rounds. If Boyett, Rice and Clay are drafted as well, these seven players would eclipse the school record for the most players taken in the NFL draft in a single season. Given these projections, it seems undeniable that the 2013 draft class is shaping up to be one of the most impressive in school history. Great draft classes do not always follow great seasons. For example, in 2011, the year after Oregon’s trip to the national championship game against Auburn, Casey Matthews was the lone Duck taken in the draft (fourth round to Philadelphia). This year, however, it is safe to say that the Ducks should follow up one of the most successful seasons in school history with an extremely prestigious draft classes. Given the talent of the Oregon players leaving for the NFL, it would not be surprising to see some of them emerge as All-Pro studs several years down the line. Keep an eye on our former Ducks during the 2013 NFL draft, and consider the fact that they could eventually become known as the greatest draft class in school history. Good luck in the pros, Ducks, and thanks for the memories.